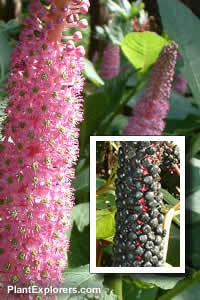 A tall ( 2m - 6.5ft ), almost shrubby perennial, this plant creates a striking garden feature with its upright spikes of purplish pink flowers in late summer, followed by closely packed clusters of black berries. For a final dramatic touch, the leaves turn golden yellow in the autumn. For maximum freshness, please keep seed refrigerated in its original packaging until it is time to plant. Sow seed in containers in early spring. Gentle bottom heat will improve germination (14-18°Celsius or 57-64°Fahrenheit). Grow on in any good well drained but moist garden soil, rich in organic matter in full sun or part shade.